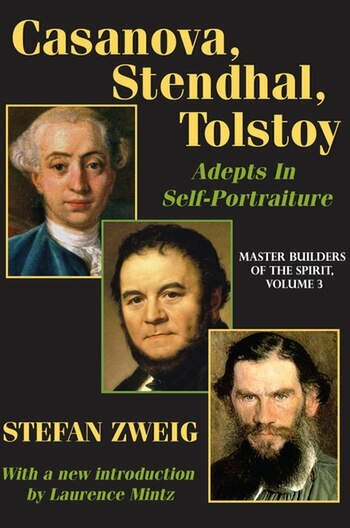 Casanova, Stendhal, Tolstoy: Adepts in Self-Portraiture, the final volume of Stefan Zweig's masterful Master Builders of the Spirit trilogy, discloses the smaller version of a writer's own ego. Unconscious though it is, no reality is as important to the writer as the reality of their own life. Giacomo Casanova, Stendhal (Marie-Henri Beyle), and Leo Tolstoy have different approaches to self-portraiture, but Zweig shows that together they symbolize three levels which represent successively ascending gradations of the same creative function. Casanova is depicted as having a primitive gradation; he simply records deeds and happenings, without any attempt to appraise them or to study the deeper working of the self. Stendhal's self-portraiture is depicted as psychological; he observes himself and investigates his own feelings. Tolstoy has the highest level; he describes his own life, records what led him to his own actions, and focuses on self-reflection in a completely unexaggerated manner. At first glance it might seem as if self-portraiture is an artist's easiest task. With no further trouble than a probing of memory and a description of the facts of life, "the truth" is revealed. The history of literature shows that ordinary autobiographers are no more than commonplace witnesses testifying to facts that chance has brought to their knowledge. A practiced artist is needed to discern the innermost happenings of the soul; few who have attempted autobiography have been successful in this difficult task. The present volume expounds the characteristics of these subjectively minded artists, and of autobiography as their typical method of personal expression.